1. The only Trans-Atlantic Low Budget Airline. If you want to cross the Atlantic Ocean for cheap, the most affordable option is Norwegian Air. It is the only real low-budget carrier operating between Europe and the United States of America. Over the years, the airline has created a massive network from various cities such as Stockholm, Oslo, Copenhagen or London, to name just a few, to many destinations in the United States. New York, Los Angeles or Fort Lauderdale are some destinations the carrier serves. 2. A Boeing 787 Dreamliner Fleet only. Norwegian Air is operating a Boeing 787 Dreamliner fleet only for it's long-haul flights. The Dreamliner aircraft burns 25% fewer fuel than other planes and it's considered to be a new generation airplane together with Airbuses brand new A350. In fact Norwegian Air is the most efficient airline with 2.5 litres fuel consumption per 100 kilometres per passenger over the transatlantic route. 3. Every Add-on needs to be paid. Let's say I want to book a flight from Copenhagen to Los Angeles. The cheapest fare I found was U$200. A good deal if you only travel with cabin luggage because every add-on needs to be paid for. If I want to check in a bag up to 20 kg I need to pay an additional $35. Probably the best deal is the "LowFare+" which lets you check-in one bag. 4. Free WI-FI on all Continental flights. A really refreshing feature for a low-budget carrier is the Free Wi-Fi Norwegian Air offers on it's European network. Most of the 120 Boeing 737-800 are equipped with a high-speed broadband network. I was also quite impressed with its speed. You can easily watch videos and browse the internet. For example Emirates internet was very slow and cost you a minimum of $10 for just a few mega bytes. The best internet connection is probably available on Cathay Pacific's brand new Airbus A350. 5. 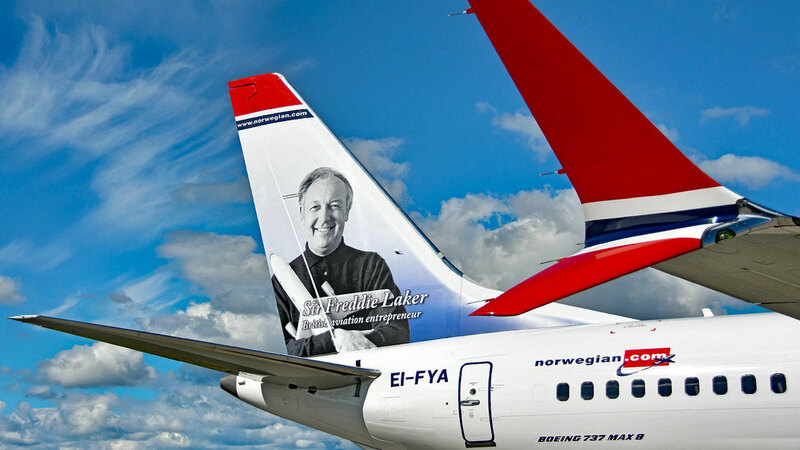 Norwegian Air's special Tail Art. 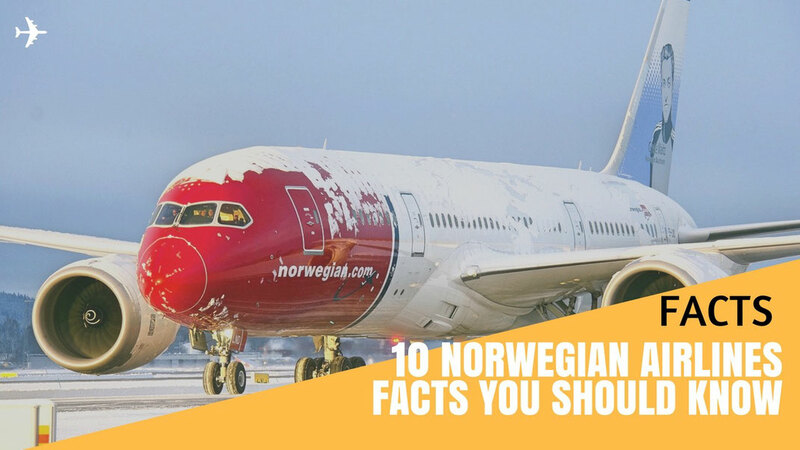 The airline features a special tail art on each individual airplane featuring depictions of historically significant Norwegians, Finns, Danes, and Swedes as well as Americans, British and Irish. One of the most significant characters are Roald Amundsen, the first men to reach the South Pole or Freddie Mercury the lead vocalist of the Rock band "Queen". Find a list with all the Tail Fin Heroes here. The base livery of all planes is white with a signal red nose. 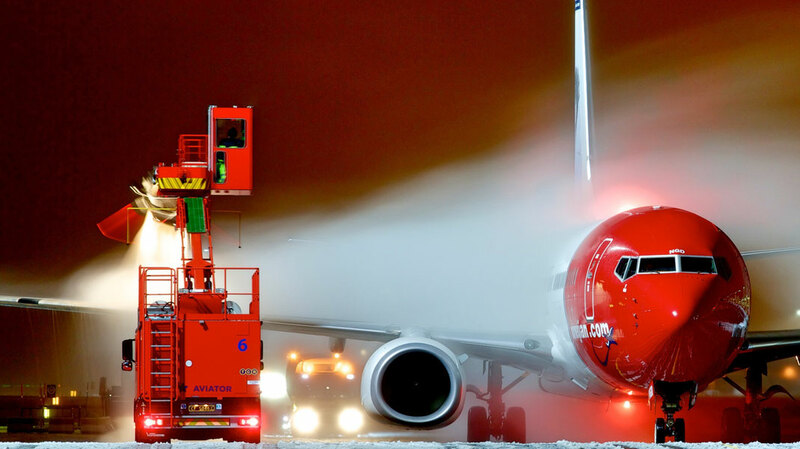 Since most of the airplanes operate around the arctic circle, the red airplane nose makes it easier to locate the airplane in snowy regions in case of a rescue operation. 6. First Transatlantic flight in a 737MAX. 99,9% of flights operated between North America and Europe are wide-body aircrafts such as Boeing 787, 777 or 747 as well as Airbus A330's or A350's. 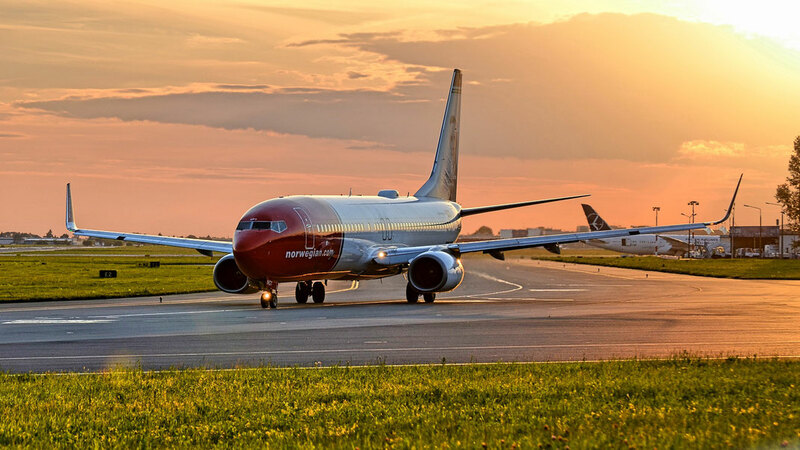 But in 2017 Norwegian started to connect cities such as Edinburgh, Cork or Shannon with provincial airports in the United States starting a complete new era since those flights are flown by a narrow-body, single aisle Boeing 737MAX. The airline offers daily flights between the Scottish capital Edinburgh and Stewart International, an hour North of Manhattan as example. Additional flights from Norwegian out of Stewart to Belfast, Northern Ireland; Dublin and Shannon, Ireland and Bergen, Norway will start later in 2017. Flights are currently on sale for less than $79! 7. World’s Best Low-Cost Long Haul Airline in 2017. 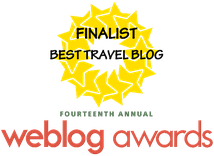 In 2017 Norwegian once again won the "World's Best Low-Cost Long Haul Airline" award, finishing ahead of Air Asia X, which is also a real giant in the budget-carrier market. The Singaporean carrier Scoot finished 3rd, followed by JetStar Airways and Air Canada Rouge. While Air Asia's Premium seating is much closer to a Business Class product Norwegian offers a great Economy Class product with a personal entertainment system and newer seats. 8. CEO Bjorn Kjos is a former fighter Pilot. Norwegian Air's CEO, Bjorn Kjos is a former fighter piloted for the Royal Norwegian Air Force. He flew the controversial Lockheed F-104 Starfighter but was also trained on the Northrop F-5 Freedom Fighter. In 2009 him and a few former Busy Bee Airline employees started Norwegian Air Shuttle, operating a Fokker 50 only fleet. The airline only operated domestic flights within Norway and later expanded it's network throughout Europa, North America and Asia. 9. New London to Singapore flight with Norwegian. The London-Singapore route is one of the busiest international route on earth with over 1,4 Million passengers a year. Currently operated by Singapore Airlines and British Airways, both operating the route on an Airbus A380. Also Qantas is moving its Asia hub back to Changi Airport from Dubai and will offer non-stop flights to Heathrow on their Super Jumbo as well. The cheapest option is going to be Norwegian Air though. The airline started a direct service from Gatwick to Singapore on 28 September 2017 and will operate 4 times weekly for half the price. 10. The first operator of the Airbus A321LR. 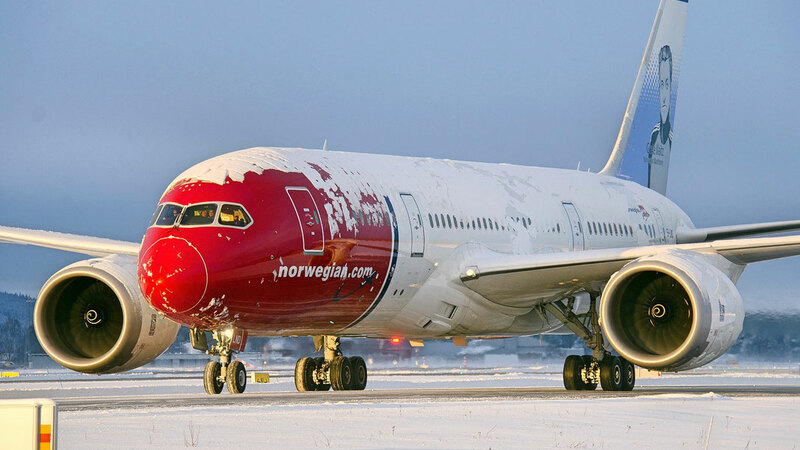 The Norwegian Airline is more and more focused on introducing more flights between Europe and the United States, perhaps even Canada in the near future. Part of the concept is also to operate more single-aisle jetliners on the transatlantic route such as the 737MAX which is already operating certain routes. The brand-new Airbus A321LR (LR stands for Long Range) which is expected to join the fleet by 2019, will be able to comfortably serve any destination along Americas East coast, including Florida from London and Paris. The new A321LR has a reach of almost 7,400km. The first 747-100 for instance, had a reach of 9,000km.